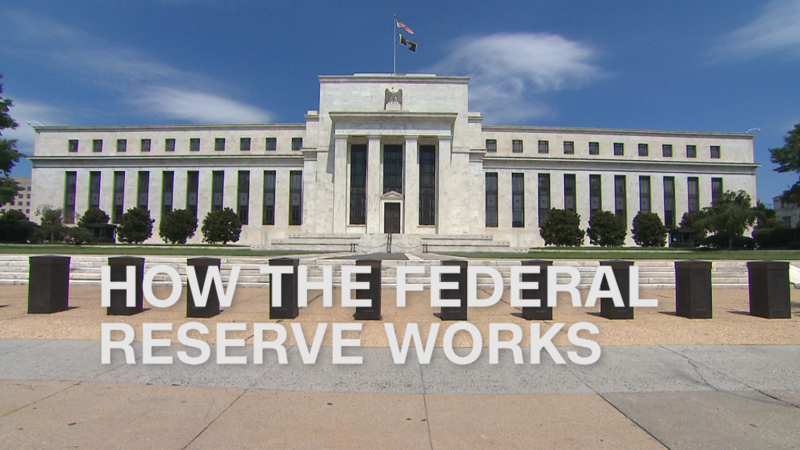 The Federal Reserve is leaving interest rates alone to give the economy room to keep growing. But the central bank did take historic action on Wednesday: It will begin undoing the extraordinary steps it took to prop up the economy for almost a decade after the financial crisis. The Fed said it would begin shedding some of the $4.5 trillion in investments starting next month. The announcement marks a milestone in the long recovery from 2008, and reflects confidence by Fed officials that the economy will continue to grow. Starting in October, the Fed will begin unloading $10 billion of debt from its so-called balance sheet, including $6 billion in Treasury securities and $4 billion in agency debt each month through December. For years, the central bank piled up purchases of Treasury and mortgage-backed securities, a strategy intended to stimulate the economy by reducing borrowing costs for everyone. At the time, it also reduced its benchmark interest rate to zero, and only began raising it in December 2015, seven year after the crisis. On Wednesday, the Fed left rates unchanged, hovering between 1% and 1.25%. The central bank has raised that rate three times since December as the economy has gradually improved. Raising rates too quickly could risk hobbling the recovery. Still, the majority of Fed policymakers signaled on Wednesday that they expect to lift rates one more time this year. Central bankers pointed to signs of strength in the U.S. economy, including a pickup in household spending and growth in business investments, in a statement following the Federal Open Market Committee's two-day meeting. "Job gains have remained solid in recent months, and the unemployment rate has stayed low," the Fed said in a statement. While Fed officials cautioned that the devastation of Hurricanes Harvey, Irma and Maria would hold back the U.S. economy in the "near term," they said the storms would not "materially alter" the country's economy overall. "Within a few months, rebuilding activity has typically kicked in, returning economic growth to normal—or maybe even a little higher than normal," wrote Eric Winograd, AB senior economist in a note. "So, despite the storms, we're still confident the U.S. economy will keep its momentum, because the foundations are sound." Related: Fed Chair Janet Yellen warns - Monitor your credit report! Some Fed officials have warned against raising interest rates until inflation -- which reflects the prices of everything from meat and cheese to houses and cars -- meets the goal of 2% that they consider healthy for the economy. But inflation is still running below that target, even though the job market has picked up and other explanations have fallen away. In a press conference, Fed chair Janet Yellen described it as something of a "mystery." In past years, she said the Fed has been able to point to root causes of low inflation: the gap between those employed versus those that aren't, energy prices and a rising dollar. "This year's inflation shortfall is more of a mystery," Yellen told reporters at the press conference. "I will not say that the committee clearly understands what the causes are." Central bankers have been in a bind over when to lift rates again. Inflation has been stubbornly low for years, suggesting the Fed should hold off. But economic growth and low unemployment suggest they should act. Fed officials cautioned that they do expect inflation to be higher than normal -- at least for a little while -- following the hurricanes that have devastated Texas, Florida and now Puerto Rico. "Inflation remains the wild card of Fed policy and the temporary boost to gasoline prices following the hurricanes only clouds the picture further," said Bankrate.com's chief financial analyst Greg McBride. "Whether the Fed hikes in December will remain an open question until December." Along with one more rate hike this year, the Fed also predicted three more possible moves next year. "It is too soon for the committee to conclude that the recent slowing in inflation was sufficiently permanent to alter the Fed's plans," Michael Gapen, a Barclay's analyst wrote in a research note. The Fed said it continues to expect inflation to remain at 1.6%, below its target, and the unemployment rate to be 4.3%, based on its updated economic projections. The central bank did, however, offer a rosier picture of the overall economy, upping its economic growth forecast to 2.4% from 2.2%. Yellen again declined to address speculation about whether President Trump will nominate her for a second four-year term leading the Fed. Her first term ends in February.